As it turns out, we won’t be going with the Lowe’s cabinets after all. Our electrical quote came in much lower than expected, the bin rental was also lower than our estimate, which meant getting the Aya Kitchen was back in consideration. We did flipflop on this one… Aya doors looked and felt nicer, had nice hardware, but the upgraded Lowes cabinets were plywood construction with dovetail joints. Lowes was also cheaper but we’d have to take care of the extras (like glass doors) whereas Aya was all in one and the price difference now wasn't that great. Seeing the great Aya kitchen at Junebug & Frisco’s place helped seal the deal. In the end, we decided to go with the Aya. 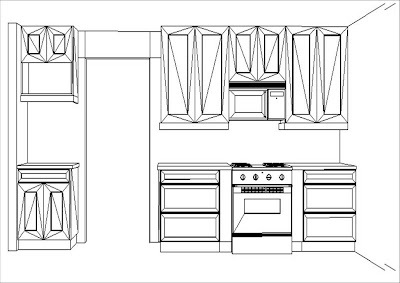 So here is the revised kitchen plan which is a little different from the Ikea plan mockup I put together. Let’s take a tour. This is the west kitchen wall. The leftmost cabinets are the new workstation. We used to have a narrow pantry there but two days ago, but thanks to HandyMan’s handy skills, that is now gone and this new space is framed in. We’ll put cookbooks in the open shelf along with an iPod docking station with wireless speakers. We’re not big audiophiles and figure we can just move the speakers from the kitchen to the living room if needed. Below the uppers, we’ll have a wall-mounted flat screen TV on an articulating arm. 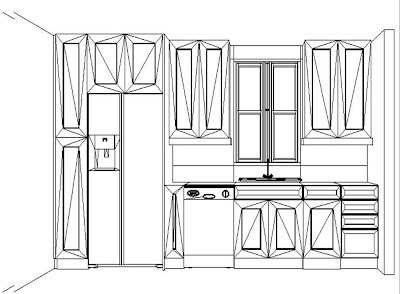 The lower cabinets will house the bigger appliances – KitchenAid stand mixer, blender, George Forman grill etc. To the left of this workstation, on the wall leading down the hallway, we’ll be putting a full-length chalkboard. It’ll be framed out in the same Shaker style as the cabinets and will have a strip of hooks mounted on top to hold keys (the side entrance enters right near this chalkboard). I really wanted to have a hidden cabinet behind the chalkboard, but the studs are too close together at that point, so this is the best solution. The doorway leads into the dining room. To the right of the doorway, we have storage galore. Lots of deep pot drawers and uppers! Around the range, we’ve got a pull-out spice rack on the left and narrow cabinet for cookie sheets on the right. Since the stove is being moved from the other wall, HandyMan will have to run the air vent through the ceiling and out to a new hole through the exterior brick. Hole in brick? Yikes! The run of cabinets stop short of the sliding glass doors on the north end of the room. You can see our whole kitchen from the back deck (which really creeps me out sometimes), so I may put some drapes in front of the sliders. On the east kitchen wall, we’ve got a full-height pantry on the left with a mix of fixed and pull out-shelves. Beside that is the counter-depth French-door fridge. In the base cabinets, we’ve got a pull-out with two metal shelves (to house baking supplies, rice, bulky items etc); dishwasher, a pull-out recycling drawer, and a bank of drawers. If we had put the dishwasher on the right of the sink, we’d have room to widen the metal shelves enough for them to store the KitchenAid… but that would mean the dishwasher was visible from the dining room. Not good. So, we’ll live with this setup and I’ll have to crouch below the workstation to get the KitchenAid for those once-in-a-blue moons when I do some baking. The uppers on either side of the window all have glass fronts and will keep this wall of cabinets from feeling heavy. I’m thinking we paint the back of the cabinets, maybe a pale yellow to tie in with the dining room, and to make my white dishes pop. To finish off the room, we’ll have a roman blind shade on the window, a hanging schoolhouse mini-pendant over the sink, 4 recessed pots, and a fresh clean palette of white, grey, touches of yellow, and black. We're pretty happy with the layout of our tiny galley kitchen. Anything we've forgotten? Nope, I don;t think you've forgotten anything! Wowsers it looks fab! Can't wait to see it come together! Just to let you know too, your study totally inspired me...and we finally (nearly!) finished ours on the weekend. Just the splashback style pinboard to so now! I am sitting at the new desk now! Love the glass fronted cabinets. I did one during my kitchen redo, and put one of the recessed cabinet lights at the top of it with glass shelves. Makes my dishes look a lot fancier than they are! Kitliz, we debated whether to have glass shelves and recessed lights too. But with the pendant light, 4 recessed pots, and undercabinet lighting, we were thinking it might be a bit much for our small kitchen. Took a peek at your flickr kitchen pics... you did a great job on your reno! Thanks Julia. You're right...I'm already getting impatient! What is the cost for your cabinets from aya? We are thinking of going with them over Ikea. My husband & I had an Aya Kitchen installed in April. We are still waiting for 2 replacement doors and a faceplate....it is now June. We aren't getting any response from our designers in Barrie ON ..Northern Design....lousy customer service...they demand your full payment before the truck is unloaded...before you can even check that everything is there and not damaged. Well ours was damaged, salesman is not helpful, neither is the "service dept", service?? what service??? SO I AM SPREADING THE WORD, buyer beware of the policies of these so called design specialists and DEMAND to be able to examine the shipment BEFORE you pay. Do not buy anything from Aya. They take out and shoot their customers regularly. The only honest person in the whole deal was the sales person. How scary is that !! And, she left the company in a hurry. I am still waiting on completion of the kitchen 5 month after initial installation was supposed to complete. No one in the branch or headquarters gives a damn. But, if they smell a buck they are on it like a pack of hungry wolves. Anons - that's unfortunate that you've had a poor experience with Aya. But thanks for leaving your comments...I think buyers near to hear both sides of buying from a particular supplier. From my own experience, I have nothing but good things to say so far. There was a miscommunication with the installer and he ended up working a 11-hour day to get our kitchen in, even offered to install our non-Aya knobs for us free, so from my perspective their service is excellent. I also paid for the cabinets in full before installation and didn't inspect them when they came off the truck. However, we have a post-installation inspection to deal with deficiencies (of which I haven't seen any) so it wasn't a big worry. I am truly glad that your issues were minimal. It is good to hear that they do right by some customers. I have given up on them and created a story describing my pain dealing with the dark side of customer service (ayakitchenssucks.us). Hopefully you will never experience it.